Sting may be known for his work with The Police and his subsequent solo career, but his latest project has revealed something new about him. He will bring that project to town next Tuesday, when he kicks off the Asia leg of his 'Symphonicity' tour at the Olympic Gymnastics Arena in southern Seoul. The tour is an extension of his recent album, 'Symphonicities', in which he worked with an orchestra to create symphonic arrangements of some of his biggest hits. The highly acclaimed worldwide tour kicked off in Vancouver, with subsequent stops throughout North America and Europe. The Seoul concert marks Sting's third appearance here, after concerts in 1996 and 2005. "The Christmas holiday passed as I travelled around North America with [the] Royal Philharmonic Concert Orchestra from Britain and my Asia-Oceania tour is to kick off in Seoul, with the country's Korean Symphony Orchestra," the British superstar said in an e-mail interview with the Korea JoongAng Daily. "Both my band and I are full of expectations for the collaboration." Two days after taking the stage here, the singer-songwriter, who is best known for his husky yet lyrical voice and poetic lyrics, will continue on to Japan, Australia and New Zealand. He wraps up the eight-month tour in Chile on Feb. 25. You seem to have been doing a lot of work in classical music lately, as seen from your recent albums such as 'Symphonicities', 'If On a Winter's Night' and 'Songs from the Labyrinth'. Do you think classical music is the ultimate destination for all musicians? I've loved classical music my whole life so it's not as if I've magically become an age when classical music appeals more to me than any other type of music. As for this project ('Symphonicities') - if I were forced to define what we have done, I would describe it neither as classical nor pop, it is orchestral music constructed around songs from a variety of genres. My interests and influences are diverse and the show especially reflects this diversity. You have experimented with different kinds of music throughout your career. What made you want to work with an orchestra? It was the Chicago Symphony who originally asked me to put together a program of my music for a benefit concert. I was determined that although we would be playing pop music, the orchestra would still find the arrangements challenging to play, especially rhythmically. This proved to be the case, and the orchestra thoroughly enjoyed the experience, as did the audience, and me! This tour, the album and the new DVD release 'Live in Berlin' have all followed as a result of that first concert. For the program, I wanted to balance what was familiar - recognizable hit songs, with less well-known and more esoteric material. I believe that balance has been achieved, appealing to the casual listener as well as the more demanding. Some of the choices were obvious, for example where I had pilfered themes from classical pieces, like Prokofiev's 'Kije', or bits of J.S. Bach. It was fun to ask the orchestra to play rock and roll with the same rhythmic intensity as if they were playing 'Le Sacre du Printemps' ('The Rite of Spring'). How would you compare working with an orchestra to working with a band? In a rock band you are often only working with three or four primary colors; with a symphony orchestra you are given an entire palette, a full spectrum of light and shade, nuance, dynamic contrast, and this richness is reflected in the evolution of the songs into orchestral pieces. Dressing the songs in these new orchestral clothes has given them a freshness, breathed new life into them, subtly altered the meaning and emotional valance of songs that may have been written 30 years ago. It is a royal gift for a songwriter. Did you have particular arrangements in mind when you started working with the orchestra? At first I would give carte blanche to the arrangers, and then once I had heard their arrangement I would tweak it to my particular needs, where I thought the orchestration was too rich, or wasn't telling the story I had intended. I very much enjoyed this collaborative process, and of course felt blessed and grateful for the services of some of the finest arrangers on the planet. What are your other musical aspirations? I'm fortunate enough to be able to do exactly as I please. Music is my discipline as well as my spiritual journey. It's also fun and it makes me happy. I'm always led by my curiosity and my desire to learn and get better as a musician. My strategy has always been to play with musicians better than myself, constantly attempting to raise the bar. Standing still is not an option. 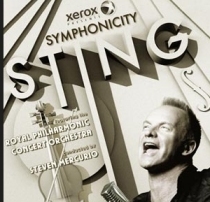 Sting Symphonicity World Tour accompanied by the Orchestra SinfÃ³nica Nacional conducted by Steven Mercurio.